Born in Kenya or Hawaii? Overwhelming evidence has consistently pointed to Barack Obama being born in Hawaii, and NOT in Kenya. But we can thank Donald Trump (as he pats himself on the back) for bringing this issue to the forefront sufficient to encourage the POTUS to finally show his Long Form Birth Certificate — and FactCheck.org verifies that it is authentic. Still die-hard birthers maintain that the Long Form Birth Certificate is fake. Snopes has addressed the latest barrage of birther allegations. the law by committing fraud. Barack Jr. is NOT eligible to be President because he is not a "natural born citizen." These Birthers hold to the false notion that to be a "natural born citizen,"
a child must have two 2 citizen-parents. States — a conclusion arrived at by an honest acceptance of simple evidence. Amazingly, some staunchly-committed birthers admit that the 2008 version of Barack Obama's Kenyan Birth Certificate is a forgery. But, they argue, a second Kenyan Birth Certificate has also appeared; a document that was allegedly retrieved from the Coast Province General Hospital in Mombasa, Kenya by Lucas Daniel Smith on February 19, 2009. This article first exposes the Photoshopped Forgery of 2008, then explain why the "new and improved" 2009 version of Barack's Kenyan Birth Certificate is also bogus. For the record, Dr Matt is Politically Independent who leans Right of Center, and is a strong supporter of the U.S. Constitution as interpreted according to the Founding Fathers' Original Intent. but this careless claim is starved of verifiable evidence. What if Barack were Born in Kenya? Citizen Parents to be Eligible — Wrong! but what you think you know . . . that ain't so! In the minds of millions of Americans, Donald Trump has managed to reinforce doubt about Barack Obama being born in Hawaii. During NBC's Today Show, Trump told Meridith Vieira that he has "people that actually have been studying it, on the ground in Hawaii, and they cannot believe what they're finding." * There is no serial number nor signature on Obama's Hawaii Birth Certificate. "I'm starting to think that he was not born here." "… and if he wasn't born in this country, which is a real possibility — I'm not saying it happened — I'm saying it's a real possibility, much greater than I thought two or three weeks ago." Based upon a testy exchange between Donald Trump and George Stephanopoulos, there is verbal and emotional evidence that Trump has trumped up a claim to capture media attention: Trump contends he has "people that actually have been studying it, on the ground in Hawaii, and they cannot believe what they're finding." As a Social Psychologist, I conclude that the Donald is totally BLUFFING! But what do I know . . . I'm just an expert on reading people's inner motives. "They cannot believe what they’re finding." What have they found? STEPHANOPOULOS: What have they found? TRUMP: It's none of your business right now. We're going to see what happens. STEPHANOPOULOS: Have they found anything? STEPHANOPOULOS: What have they done? TRUMP: George, next question, George. 2) To keep himself in the headlines and promote his Brand. Intelligent and honest observers can finally resolve this thorny issue by taking up the opposite question: Instead of asking the Innocent to prove why they are NOT guilty, put the burden of proof upon the Plaintiffs: What evidence exists that proves Barack Obama was born in Kenya? It's easy enough to cast doubt on Barack Obama's birth in Hawaii, but try proving the opposite thesis: That Barack was born in Kenya. This question is very difficult to support with verifiable evidence. I'm still waiting for one shred of solid evidence, let alone multiple facts that combine to support a Kenyan birth for Obama. When we look closely into the opposite issue, we discover this question is riddled with even greater doubt, filled with contrived lies and forgeries, and saturated with logistical quandaries that defy evidence. 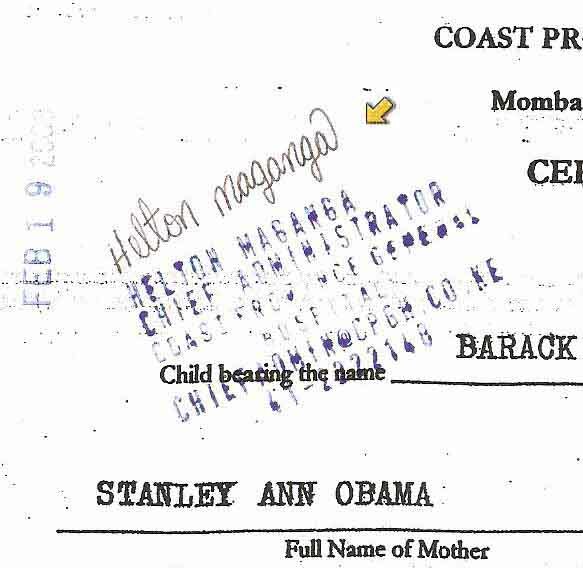 For example, the following Kenyan "Registration of Birth" for Barack Obama is an obvious forgery. 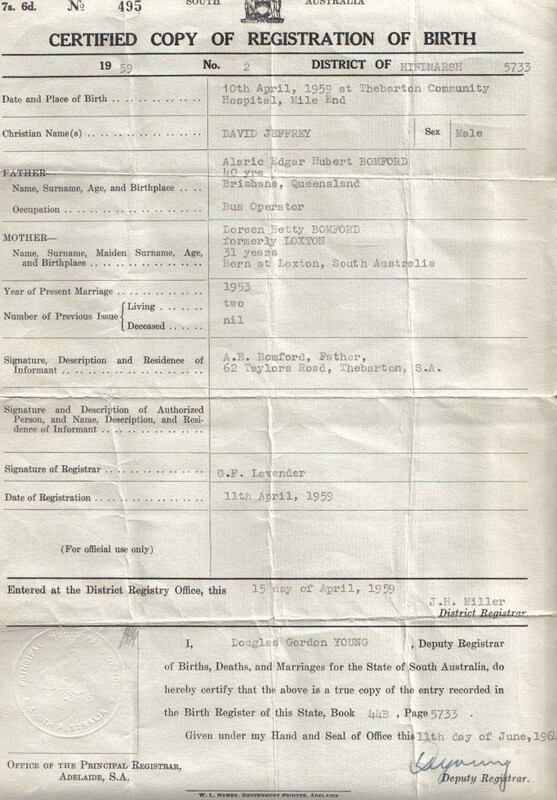 This document is based upon a real birth certificate issued to David Jeffrey Bomford, born in South Australia in 1959. First here's the forgery. You can't really make out the details of this bogus birth certificate from this photo, so keep scrolling down, and I'll provide close-ups of the parts of the document that prove it is a forgery. How can we tell that the 2008 Obama Birth Registration is a Photoshopped forgery? Closely compare the two documents: Note the "No." on the fake document: 47,044. Barack Obama was 47 years old when he was sworn in as the 44th president of the United States. The person who forged the fake left a clue to the ruse. 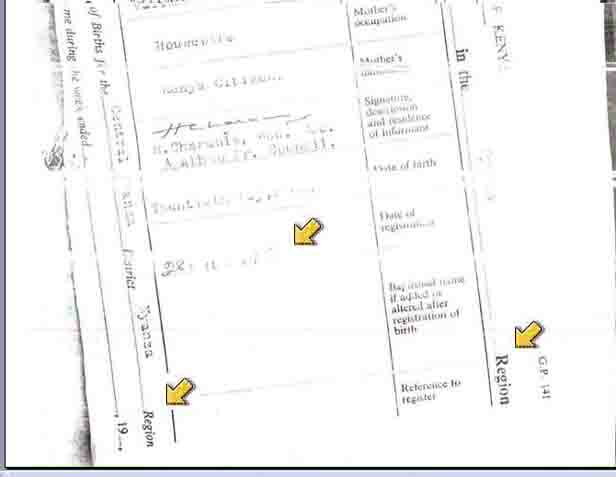 In the upper left-hand corner, both documents share the same Registration ID: "7s 6d No 495" and the same Title "Certified Copy of Registration of Birth,"and in the lower left-hand corner, the same format, e.g., "Date and Place of Birth," and the same Page No. to the right of the District "5733" — a number that is repeated at the bottom of both documents. Both documents share the same format, e.g., same columns and categories, etc. ; now, notice that the last name of the Registrar is "Lavender" on both documents, and the last name of the District Registrar is "Miller" — with middle initials being the same for both documents too (just the first initials were Photoshopped). Also observe the format for recording a date: Day, Month, Year. This the correct format used in countries influenced by Great Britain — which points to a flaw in the "New and Improved" Kenyan Birth Certificate that appeared in 2009 — which uses an American Date Format of Month, Day, Year. Here's more evidence that the 2008 Obama's Kenyan Birth Certificate is a Photoshopped Forgery: Note that the Book and Page numbers are exactly the same: "44B" and "5733"
The Forged Document (left) is dated 17 February 1964 and is issued by the Republic of Kenya, as shown below. According to Snopes, Kenya did not adopt the name, Republic of Kenya, until 12 December 1964. As of February 1964 it was known as the Dominion of Kenya. Barack's birth date and birthplace are listed as August 4th, 1961 in "Mombasa," again, that city was not part of the "Republic of Kenya" until 12 December 1963 — more than two years after Barack's birth. According to MombasaInfo.com: "The British took control of Mombasa in 1895, after the sultan of Zanzibar leased the town to the British. . . . The British rule officially ended when Kenya finally gained its hard-fought independence on the 12th December 1963." Even though the 2008 Photoshopped-Forgery was easily exposed as bogus, still millions of Americans were willing to believe this lie because it fit their political bias. The definition of an Ideologue applies: Someone who already has his or her mind made up — even when the facts say otherwise. To be clear, the people who think they know that which "ain't so" — a.k.a. "Ideologues" and" fools" — are found on the Right and Left of the Political Spectrum. This article is NOT about picking on a particular political group, it is about finding verifiable facts and believing those FACTS, regardless of which political agenda is supported or disproved. When at first you don't succeed . . . try, try again! 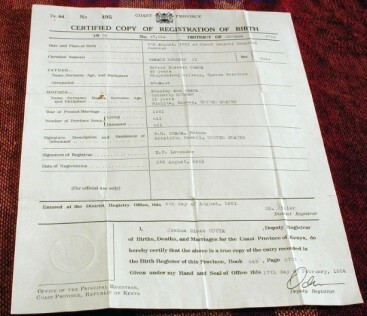 Since the 2008 version of Barack's Kenyan Birth Certificate has been clearly been exposed as counterfeit, committed birthers yearned for a way to support their continuing conspiracy. On February 19, 2009, Lucas Daniel Smith answered the conspiracy call: Smith procured (and by procured, I mean "forged") a new and improved Kenyan Birth Certificate for Barack Hussein Obama, II. * The misspelling of Heltan Maganga's signature and stamp in the upper left-hand corner. are recorded in an American format of: Month, Day, and Year. * A birth date for Barack Hussein Obama, Sr. is not recorded — only his birth year is given. * Dr. James O. W. Ang'awa is supposedly the "attending Doctor" at the birth of Barack Obama, Jr.
Saying it . . . doesn't make it so! 1) From 1 July 1895 to 12 Dec. 1963, Mombasa was part of the British East African Protectorate, so dates would be recorded in a British format of Day, Month, and Year. Lucas Daniel Smith, being an American, wrote the dates of his forgery according to an American format of Month, Day, and Year. 2) The full birth date of Stanley Ann Dunham is recorded in an American format of Month, Day, and Year (11/29/1942), but only the year of Barack Obama Sr's birth date is given (1936). If this Kenyan birth certificate were genuine, Barack Sr would have reported his birth date at the same time Ann Dunham declared hers. Barack Sr's birthday, 18 June 1936, was not known by Lucas Daniel Smith when he was creating his forgery, so Lucus didn't include that birth date. 3) Helton Maganga spells his first name with an "a" not an "o" — Heltan is the correct spelling. Note that the alleged Kenyan Birth Certificate has spelled Mr Maganga's first name with an "o" in the signature as well as the stamp. According to his Facebook page, Dr. Maganga's first name is spelled with an "a" — Heltan Maganga. From a Facebook post that announced his 50th birthday (on the day after his birthday, 18 May 2016), we know Heltan was born 17 May 1966. In this Daily Nation report, Dr Maganga's first name is spelled again with an "a" — Heltan Maganga (his name appears in the 6th paragraph of the article). A"Linked In" profile for Dr Maganga, has his first name spelled with an "a" — Heltan Maganga. In creating his forgery, Lucas Daniel Smith misspelled Dr. Heltan Maganga's name. The date that the Birth Certificate was supposedly created by the Coast Province General Hospital was 19 February 2009, and was stamped and signed by "Helton" on that date. But Heltan Maganga was not yet the Chief Administrator of the Coast Provincial General Hospital until 17 June 2009 (see 6th paragraph of this posting). Currently, Heltan is a Consultant Surgeon at Coast Province General Hospital. * In the the early sixties in Kenya, the word "province" was not used, instead the word "region" was the customary term — as verified by this real certificate. Thus, it is unlikely that the name of the Hospital in Mombasa was "Coast Province" in 1961. * This genuine Kenyan Birth Certificate shows the British format for recording dates: Day, Month, and Year. The "date of registration," though hard to read, absolutely begins with the number "28" — which can't be a month and must be a day. Again, Lucas Daniel Smith made the mistake of writing the dates in his 2009 forgery according to an American date format: Month, Day, and Year. 5) The Birth Certificate states that the Coast Province General Hospital was located in the British Protectorate of Kenya. But According to MombasaInfo.com: "The British took control of Mombasa in 1895, after the sultan of Zanzibar leased the town to the British. . . . The British rule officially ended when Kenya finally gained its hard-fought independence on the 12th December 1963." (Historical Facts also confirmed here). So Mombasa what not part of Kenya until 1963. 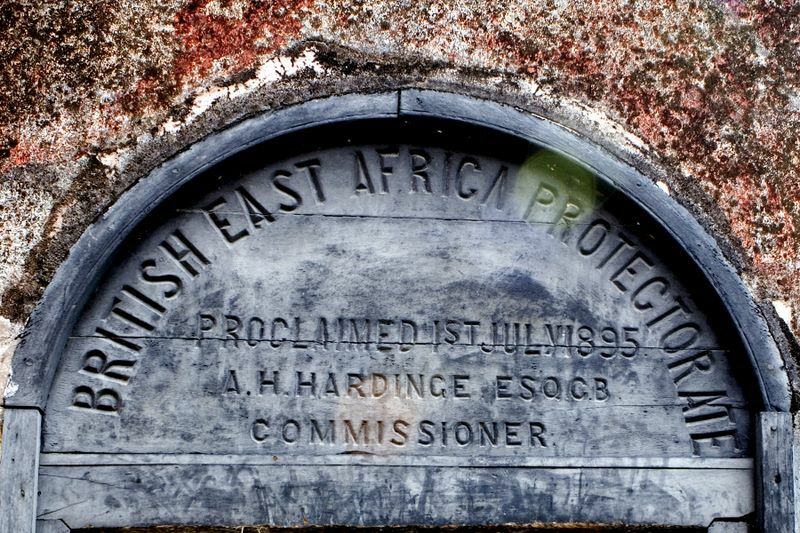 In 1961 the governing power in Mombasa was called the: British East African Protectorate. On the day Barack Hussein Obama, II was born, August 4, 1961, Mombasa was not yet part of Kenya; again, Mombasa become a part of Kenya two years after Barack's birth. Thus, the title "British Protectorate of Kenya" would not have been on a genuine birth certificates issued in Mombasa, in 1961. 6) According to an investigation by World Net Daily, Dr. James O. W. Ang'awa, the attending Doctor named on the 2009 birth certificate, never worked at any hospitals in Mombasa. Instead, Dr. Ang'awa worked at Kenyatta National Hospital in Nairobi. * Were you the Chief Administrator (or acting Chief Administrator) of CPGH on Feb. 19th 2009? * Do the stamp and signature that appear in the attached document appear to be your stamp and signature? issued by CPGH in 1961 would look like? Dr Maganga's brief email reply to Jim Byrne was this: "The answers to all your questions is a resounding NO." 8) Finally, the following questions about travel logistics reveal major inconsistencies and obstacles that Barack Sr. and a pregnant Ann Dunham could have even flown to Kenya in 1961, because the 12,936 miles journey would have required 5 different planes changes within two different airlines, at a cost far beyond the affordability of college students. * What were Barack Obama, Sr. and Stanley Ann Dunham doing in Mombasa in the first place? * Once Barack Sr. & Ann Dunham allegedly landed at the Nairobi Embakasi Airport, why would the expectant couple proceed to travel east 300 miles to Mombasa, instead of traveling west 250 miles to Barack Obama Sr's' hometown of Nyang'oma in Nyanza Province? If the couple were in Kenya at the time of Barack, II's birth, the most likely place for them to visit was Barack Sr's hometown — and not Mombasa. They could not have flown directly to Mombasa from Hawaii back in 1961, because an International Airport at Mombasa was not established until 1979. If Barack, Sr. and Stanley Ann actually did fly to Kenya for the birth of their child, they would have flown into the Nairobi Embakasi Airport — Nairobi being the city where Barack Sr had another wife (do you think Barack and Ann visited?). Here are photos of the Airport in Nairobi, Kenya in 1958 when it first began operation. "The idea that his heavily pregnant mother (flying is not at all fun for pregnant women) would get on an early 707 and fly at great expense to some foreign country is ridiculous . . . Do you know how many different flights she would have had to take to get to Kenya in 1961? Honolulu to California, California to the East Coast, the East Coast (refueling at Gander Bay, Canada) to London, London to maybe Cairo, Cairo to Nairobi. How much would that have cost? And then you would be stuck having your baby in Africa rather than in a modern American hospital in Honolulu. Or you could go the other way around the world — it’s about the same distance either way. Kenya and Hawaii are more or less on the opposite sides of the globe, almost as far apart as two places can be. This is a very silly idea." This 1959 Map of Pan American Flights confirms that a realistic route from Honolulu to Nairobi involves booking connecting flights. The 1969 Map of Flight Routes shows that Pan American World Airways had no flights into Nairobi, Kenya of any of the adjoining countries on the African East Coast. However, BOAC had flights into Nairobi in 1954. This means a trip from Honolulu to Nairobi would involve coordinating flights from at least two separate airlines. According to information at Pan American World Airways, the first regular jet service between New York and Paris began in October 1958. Within two years Pan Am made a complete transition from propeller planes to jets. In 1961 Pan Am were using the Boeing 707 - model 321, and the Douglas DC-8. The 707-321 traveled at a speed of about 600 mph and had a range of 3900 miles (the 707 just prior to "model 321" had a range of 3200 miles), before refueling was needed. The distance between New York and London is 3460 miles. Depending upon the model of the jet, a refueling stop at Gander Bay Canada may, or may not, have been necessary. By 1962, the next generation Boeing 707, model 321B, had a range of 4600 miles — at which point fueling stops at Gander Bay started to diminish as airlines upgraded their fleets. Here's a LINK to a discussion about air travel in the early 60's. From this lively online discussion, I learned that the cost of air travel in the early 60's was prohibitive for the average person, and that boat travel was more commonly used for intercontinental travel because it was more affordable. Consistent with this conclusion, a United Kingdom website states that: "Flying is not what it used to be. In the 60s it was glamorous and stylish. To fly meant you had arrived, you were part of the jet set. Certainly flying was still for the privileged few . . . Air travel had an image of glamour and excitement in the 60s. Air travel was for the rich and famous." A Government Commission (<--- CentennialOfFlight.gov Link doesn't work — Government efficiency strikes again), assigned the task of writing a history of Flight in the United States during the Centennial year of Flight, said this: "But by the 1960s, air travelers were still mostly wealthy people and business people on expense accounts, who flew repeatedly. Most Americans could not afford to fly, to see their loved ones in other cities, or visit exciting vacation spots." What Flying Was Like In The 60's — "Flying was expensive. For example: A round trip ticket between Cleveland and Washington D.C. was about $75." So Air Travel in the 1960s was expensive, and at the same time, Barack Obama Sr. was a student at the University of Hawaii, and living on a meager budget, according to a 1959 article published in the Honolulu Star-Bullitin. Assuming that Barack Sr and Anna got a free 2558 mile canoe ride from Honolulu to Los Angeles, this brings the total cost of our round-trip fares from Hawaii to Nairobi and back to an underestimated cost of $958.00 for one person and $1,916.00 for two tickets. Adjusting for inflation, $1,916.00 in 1961 would be equivalent to $13,000.00 in 2005. Remember, this cost scenario is an underestimate — it completely discounts the cost to travel 2,558 miles from Honolulu to Los Angeles, and another 2558 miles back. This cost estimate assumes a FREE 5,000 miles round-trip canoe ride between Hawaii and L.A. Because I couldn't accurately document the cost of a flight from Honolulu to Los Angeles in 1961 — I estimated the cost at ZERO. What are the chances that a poor college student could even come up with the equivalent of $13,000.00 dollars, let alone want to spend $13,000.00 just to drag his 8-month pregnant wife half way around the world to attend a Muslim Festival in Mombasa, and eventually have a baby delivered in a primitive third-world medical facility? 2) It would be a bad decision based upon Obama's student budget — he couldn't afford it! But throwing all logic to the wind, and assuming that Barack Sr & Ann actually did fly into Nairobi Embakasi Airport, again, why would the expectant couple proceed to travel east 300 miles to Mombasa, instead of traveling west 250 miles to Barack Obama Sr's' hometown of Nyang'oma in Nyanza Province? If the couple were in Kenya at the time of Barack II's birth, the most likely place for them to visit was Barack Sr's hometown — and not Mombasa. But then again, you know how ladies in their 8th month of pregnancy just love to attend a good Muslim Festival on a hot August day in Africa . . . NOT. Traveling 550 Miles for a Hospital? So, let's assume that Barack Obama, Sr and Ann traveled to the the small village where Barack Sr. grew up — Nyang'oma, located inland near Lake Victoria. With the city of Nairobi 250 miles away, why would Barack Sr. and his wife Ann then travel 550 miles to the coast of Kenya, to have Barack, Jr. born in the Coast Provincial General Hospital of Mombasa? If you peruse a map of Kenya, you will see that traveling from Nyang'oma to Mombasa, a person will pass through Nairobi, the Capital of Kenya. But Barack, Sr. and Ann Dunham didn't even need to travel 250 miles to find a hospital in Nairobi, because 37 miles to the east in Kisumu, the Aga Khan Hospital has been operating since 1957. In 2008, traveling to Kogelo-Nyang'oma is described as "more than an hour's drive from Kisumu along a pot-holed highway and then a rich-red dirt road." If it takes more than an hour to travel 37 miles in 2008, THEN how long would it take to travel 550 miles from Kogelo-Nyang'oma to Mombasa? In modern-day Kenya, it takes about 5-1/2 hours to travel from Kisumu to Nairobi by matatus (minibus), so how much longer would it have taken in 1961? Adding the travel time from Nyang'oma to Kisumu, plus a couple of hours more to account for BAD road conditions in 1961, a couple would spend most of a day traveling to Nairobi. And instead of checking into a hotel to rest for another day's journey to Mombasa, why not just check into a Hospital and save yourself 300 more miles of jolting up and down on pot-holed roads. This IS an actual photo the Kisumu Airport, I was just kidding about the "4" total people who run the airport — there are really five "5" people who run the airport (kidding again). 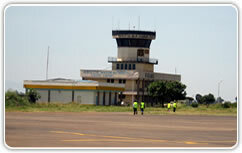 Seriously, the Kisumu Airport was built in 1930. I'm still researching whether commercial flights were available from Kisumu to Mombasa in 1961? I seriously doubt it. Birther Alert! The 550-mile trip from Nyang'oma to Mombasa . . . NEVER HAPPENED. Kogelo-Nyang'oma IS definitely where the Obama Family hails from, zoom in on this Map and see two schools named after "Senator Barack Obama." Granny Sarah Onyango Obama continues to live in the remote village of Kogelo to this day, in a 2-room hut — just a stone's throw from Nyang'oma. The Birthers make a big deal about the Birth Certificate of Barack Obama; they scream: SHOW ME THE BIRTH CERTIFICATE. 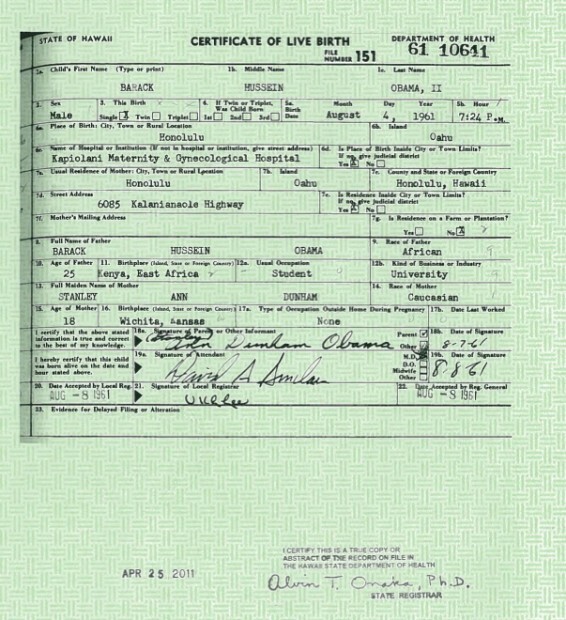 Both Snopes and FactCheck.org have thoroughly documented the real existence of a genuine "Hawaiian" Birth Certificate for Barack Obama. Of course the "Birthers" are the few people on earth who believe that Barack Obama was NOT born in the USA, and thus NOT eligible to be President. The Staff of FactCheck.org has actually seen, touched, smelled, and tasted Barack Obama's "Certificate of Live Birth" — and for your viewing pleasure, FactCheck has photographed it! This is not the Long Form Birth Certificate that Obama released in April 2011; this Birth Certificate can be used for identification in obtaining a passport and was made available available to public perusal back in 2008. 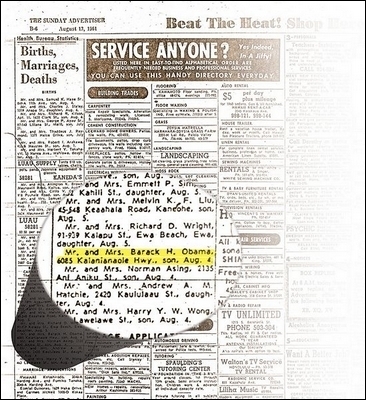 But in the end, convincing evidence that President Barack Obama was born in Hawaii, is also very simple evidence: Here's an announcement of Barack's birth published in the Sunday edition of the Honolulu Advertiser, August 13, 1961. An identical announcement appeared in the Honolulu Star-Bulletin. FactCheck.org writes: "Of course, it's distantly possible that Obama's grandparents may have planted the announcement just in case their grandson needed to prove his U.S. citizenship in order to run for president someday. We suggest that those who choose to go down that path should first equip themselves with a high-quality tinfoil hat." Birthers erroneously reason that merely raising the possibility that Barack Obama's grandparents could have planted the newspaper announcement is evidence enough — when in reality, it's NOT evidence at all. Proceeding without a whit of empirical evidence to support the possibility, Birthers speculate a conspiracy so improbable — a conspiracy cover-up hatched a half-century ago — that the only people who believe it are fixated ideologues driven by pure political bias. "The plain truth will never mollify a Truther. There’s always a convoluted excuse — some inconsequential discrepancy to seize on, some photographic “evidence” to magnify into a blur of meaningless pixels — that will rationalize irrationality.... But a dangerously large segment of the birth certificate hunters have lurched into rabid Truther territory.... They assert that the “Certification of Live Birth” produced by Obama was altered or forged. They claim that the contemporaneous birth announcement in a Hawaii newspaper of Obama’s birth is insufficient evidence that he was born there. (Did a fortune-teller place it in the paper knowing he would run for president?). And they accuse anyone who disagrees with them of being part and parcel of the grand plan to install Emperor Obama and usurp the rule of law. I believe Barack Obama was born in Hawaii on U.S. soil. I believe fire can melt steel and that bin Laden’s jihadi crew — not Bush and Cheney — perpetrated mass murder on 9/11." This particular email employs a typical tactic of propaganda: un-referenced assertions like: "This is part of what Obama has spent almost $2M to hide" — even Donald Trump was foolish enough to buy this unsubstantiated babble, and he repeated it as if it were true. But where is the evidence that Barack Obama has spent two 2 million trying to hide details about his birth? The email simply asserts and does not back the claim with evidence. And we all know . . . Saying it, doesn't make it so! PolitiFact has vetted the allegation that Obama spent $2 Million to hide details about his birth, and found it to be False. Another tell-tale tactic employed by propaganda pushers is sending out emails written by . . . nobody! People who fabricate lies, do not want to be identified. Forwarded emails written by Anonymous Authors are Red Flags signaling unreliable information. "I asked a British history buff I know if he could find out who the colonial registrar was for Mombasa in 1961. He called me up a few minutes ago and said "Sir Edward F. Lavender"
But the anonymous author of the email refers to an anonymous "history buff," and unless such "sources" have names and addresses, Mr History Buff might as well be the Easter Bunny, because any attempt to follow-up and verify are impossible. The deluge of Forwarded Propaganda that intrudes upon email boxes everywhere, is notorious for simply asserting a false message; the author of the propaganda is usually unidentified, and the message has no references that link to verifiable evidence. Speaking of verifiable evidence, there is no such person as "Sir Edward F. Lavender" who was supposedly a Registrar in Mombasa in 1961. On the other hand, there IS a person named G. F. Lavender, who was a Registrar in South Australia in 1959. Here's the story that Birthers expect us to believe: Just days before her due date, Stanley Ann Dunham accompanied by Granny Sarah Onyango and Barack Obama, Sr. are in Mombasa, Kenya to attend a Muslim Festival. And on a hot day in August, 1961, we are to believe that Ann Dunham wants to go swimming in the Indian ocean about 5:30 pm. QUESTION: Is this typical behavior for a pregnant woman? She's supposedly attending a Muslim Festival on a very hot day, thousands of miles from her Hawaii home. Here Mrs. Obama is 8.9 months pregnant, ready to pop at any moment, and she's taking a dip in the Indian Ocean to "cool off." Is this believable behavior for a woman just days before her DUE DATE? Why are the couple in Kenya in the first place? Did Barack Sr. and Stanley Ann originally go to Kogelo-Nyang'oma (the Obama Family stomping grounds), and then travel to 550 miles to Mombasa? Or did Granny Sarah travel 550 miles alone to meet up with Barack, Sr. and Ann in Mombasa for the Muslim Festival? This after the couple completed a 10,750 mile flight from Hawaii? "On August 4, 1961 Obama's mother, father and grandmother were attending a Muslim festival in Mombassa, Kenya. Mother had been refused entry to airplanes due to her 9 month pregnancy. It was a hot August day at the festival so the Obama's went to the beach to cool off. While swimming in the ocean his mother experienced labor pains so was rushed to the Coast Provincial General Hospital, Mombasa, Kenya where Obama was born a few hours later at 7:21 pm on August 4, 1961." Here's the problem with this account: Granny Sarah Onyango does not speak English, her native tongue is Swahili. Thus the above statement has to be a translation of her words, from Swahili to English. Such a translation would result in uneven English, instead of a smoothly written account. Where is the Swahili version? And who was the translator of the Swahili version into English? IF this account were REAL, then the previous questions could be answered easily. Consider the implications of this claim: "Mother had been refused entry to airplanes due to her 9 month pregnancy." Does this mean Stanley Ann Dunham tried to fly back to Hawaii before the birth of her son? Exactly what "airplanes" is Granny Onyango referring to? Remember, it wasn't until 18 years after Barack Obama's birth, in 1979, that an International Airport was built in Mombasa. So, exactly which "airplanes" in Mombasa refused entry for Stanley Ann — preceding her swim in the Indian Ocean to cool off? The old "I-was-refused-entry-to-airplanes" bluff . . . just ain't flyin! Busted! Can you say: "There's a hole in that story?" There is alleged testimony from a Mombasa science teacher that Obama's birth certificate from Mombasa is genuine. At the mention of a "science teacher," that seems to lend credibility, because a "science teacher" would be a credible source, right? But where is that science teacher and what is his name? Can you say "smoke and mirrors"? The 2009 "Lucas Smith" version of President Obama's birth certificate was supposedly obtained through the help of a Kenyan Colonel who got it directly from the Coast General Hospital in Mombasa, Kenya. Getting the birth certificate from a "Kenyan Colonel" also adds some credibility, right? Everyone knows that you can trust a "Colonel" (especially for tasty fried chicken). But where is this Colonel and what is his name? Again, can you say "smoke and mirrors"? With an abundance of excellent fact-checking websites available, there is no excuse for anyone to forward fraudulent information — make that . . . no reasonable excuse! Unfortunately prejudice and laziness continue to be bad reasons why some people forward false information. that Barack was Born in Kenya? The following video has been dishonestly edited; it has taken words out of context to give an appearance contrary to the truth: Barack Obama's grandmother says he was born in Kenya. Note how the video ends immediately after the Translator, who is interpreting Swahili into English, says that Granny Sarah "was present when Obama was born." This is an example of how propaganda peddlers take words out of context, to push forward a dishonest agenda. McRae: Could I ask her about his actual birthplace? I would like to see his birthplace when I come to Kenya in December. Was she present when he was born in Kenya? Shuhubia: Yes. She says, yes, she was, she was present when Obama was born. Shuhubia: No, Obama was not born in Mombasa. He was born in America. Shuhubia: No, he was born in America, not in Mombasa. Shuhubia: Hawaii. Hawaii. Sir, she says he was born in Hawaii. In the state of Hawaii, where his father was also learning, there. The state of Hawaii. To double-check the accuracy of the preceding exchange, here's the complete audio recording of the telephone interview between Bishop McRae and Granny Sarah Onyango Obama. 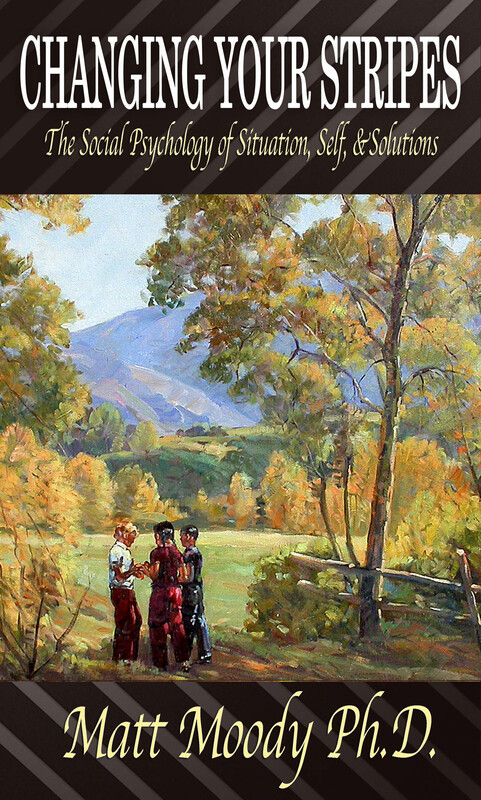 The key part of the conversation is heard beginning at 4:20 of the audio recording. So what was Donald Trump thinking when he echoed the baseless birther claim that Granny Sarah Obama said that Barack was born in Kenya? And now we understand the real meaning of what Trump said about his people on the ground in Hawaii: "they cannot believe what they're finding" — indeed, they CAN'T believe it because the findings are unbelieveable! What if Barack Obama Were Born in Kenya? The previous guidelines are for children born abroad to one U.S. citizen who is at least 19 years of age at the time of birth. Such Nationality Laws and are in compliance with Section 1 Article 2 of the United States Constitution. In 1952 Congress passed the Immigration and Nationality Act. The INA has defined the meaning of "natural born citizen" as mentioned in the Constitution. Stanley Ann Dunham was born November 29, 1942; so she was 18 years 8-1/2 months old when she gave birth to Barack Obama, II. This means Anna Dunham was a citizen only 4 years 8-1/2 months after her 14th birthday, at the time of Barack's birth — less than of the required "5 of these 10 years" for her child to receive automatic citizenship IF her child was born outside the United States. So if Barack Obama, Jr. really was born in Kenya, he would not have been an American citizen at birth — a Natural Born Citizen. Instead, Barack would have become a citizen like Arnold Schwarzenegger — through a process called "Naturalization." Anyone who becomes a citizen through "Naturalization" is ineligible to be President of the United States. If Barack Obama was born in Hawaii, he is a U.S. citizen by virtue of the 14th Amendment to the United States Constitution. What were Barack Obama Sr. and Anna Dunham doing in Hawaii? A glaring error in reason and evidence occurs whenever we examine FACTS out of context. If Barack Obama was NOT born in Hawaii, then why were his parents in Hawaii, in the first place. By simply taking a look at their life histories we discover that Barack Obama, Sr. and Anna Dunham were both students at the University of Hawaii at Manoa. Hawaii is where they first met and eventually married. Stanley Ann Dunham was named after her father, Stanley Armour Dunham. Because Mr. Dunham always wanted a son, when a daughter was born instead, he named her "Stanley" anyway — something she was teased about through her childhood. After Stanley Ann graduated from the Mercer Island High School in the Seattle Washington, the Dunham Family moved to Hawaii, where she enrolled in the University of Hawaii at Manoa. The conspiracy theory would have us believe that when Ann Dunham was in the latter stages of pregnancy, Barack and Anna hop a Jet to Kenya to visit Barack Sr's old stomping grounds — or was it primarily to participate in the Muslim Festival in Mombasa? Either explanation is quite illogical. When a woman is pregnant, especially with her very first pregnancy, priority is focused upon preparing for the birth — and not vacations in Kenya. According to the conspiracy theory, Barack Sr. and Anna attended a Muslim Festival in Mombasa on a hot summer's day when Anna was 8.9 months pregnant, and ready to POP! Of course, on a HOT day, what pregnant woman doesn't crave a dip in the Indian Ocean? And there, of all places, Stanley Ann Dunham goes into contractions; she is rushed to the Coastal Province Hospital in Mombasa where Barack Hussein Obama, Jr. was allegedly born. And there two bogus Birth Certificates to prove it! Now, if you believe that story, then I've got some beach front property in North Dakota I want to sell you. Wikipedia has thoroughly researched every angle of the "birther" conspiracy theories. Their examination of the evidence confirms what I've written here. 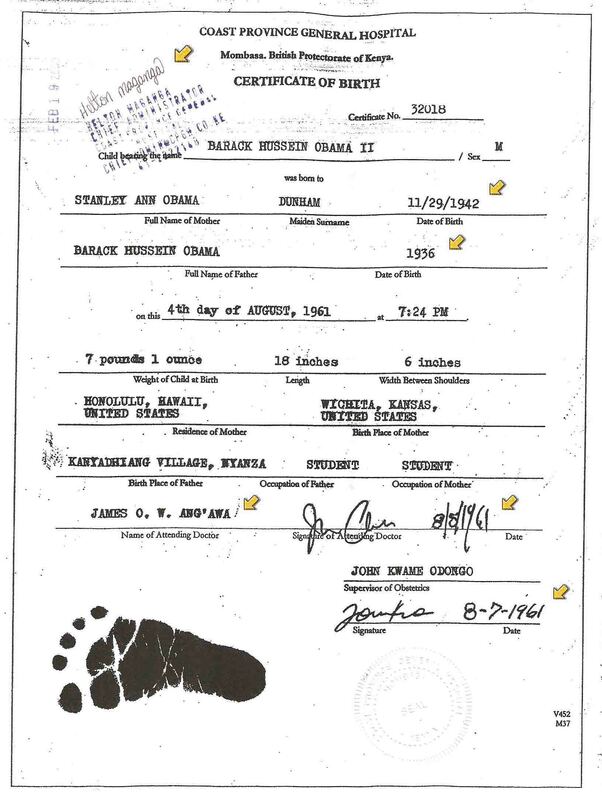 OK, the birth certificate may be real, but look at what's on Line 11: Barack Obama, Sr. born in Kenya and not an American. And in order to be President of the United States, you must be a Natural Born Citizen; according to the U.S. Constitution that means a child must be born of two citizen-parents. Clearly, Barack Obama II has only one citizen parent, thus he is not eligible to be President of the United States. Gerald Harrison: The "smoking gun" has been found and he has "powder burns" on his hands! Look no further than Line 11 of the birth certificate he produced. Remember the definition of Natural Born Citizen: BOTH Parents must be U.S. BORN citizens. His father CLEARLY is not! Dr Matt: If Barack Obama was born in Hawaii, then he is granted automatic citizenship by virtue of the 14th Amendment to the U.S. Constitution. And it does make a difference that Barack's mother was a U.S. citizen. Why? Because the 14th Amendment never intended to grant citizenship to children of two non-citizen parents. Gerald Harrison: The 14th was enacted to right the wrongs due to SLAVERY not establishing natural born citizenship. The argument STILL stands. Dr Matt: However the the 14th amendment addresses the nationality of parents when a child is born on U.S. Soil. At least one parents must be "subject to the jurisdiction thereof." What does this phrase mean? The Civil Rights Act of 1866 clarifies the original intent of the 14th Amendment with the words: "and not subject to any foreign power." The Civil Rights Act set forth that children born to parents who are still "subject to" the foreign country from which they came, are not granted citizenship by merely being born on U.S. soil — this applies to the children of visitors, diplomats, & illegal aliens. Gerald Harrison: A natural born citizen as defined within the context of the Constitution is that BOTH PARENTS must be U.S BORN citizens in order for themselves or their offspring to be eligible for the Presidency! If the American people knew their Constitution, we wouldn't have this conversation because Obama would have never been elected. Dr Matt: Gerald, U.S. Constitution, Section 1 of Article 2 states: "No person except a natural born Citizen, or a Citizen of the United States, at the time of the Adoption of this Constitution, shall be eligible to the Office of President." Gerald Harrison: Correct. Which means either Obama has to be the oldest living President at over 200 years old or both parents have to be U.S. born citizens for him to be eligible. Either way, he is not and MUST be removed from office. NOTE: With the mention that Obama needed to be 200 years old, Gerald is referring to the fact that several presidents prior to Martin van Buren were "born" as British subjects; hence, they were not "natural born Citizens." But the Constitution granted an exception for these earliest citizens to be eligible for the presidency — candidates who were not born on U.S. soil, nor were their parent born in the United States. Dr Matt: So which part of the United States Constitution establishes that both parents must be U.S born citizens for their offspring to be eligible for the Presidency? Instead of citing the U.S. Constitution, Gerald sends me a link to an article written by an unidentified author, entitled: The Conclusive Definition of "Natural Born Citizen." For people who want to get to the Truth, articles written by No One should raise a Red Flag in terms of credibility. Dr Matt: Thanks for the link. According to this article you've referred me to, the "both parents" requirement is not in the U.S. Constitution, correct? Gerald Harrison: Even though the "both parents" clause is not in the Constitution, it is the correct interpretation. Dr Matt: Is it the Correct Interpretation of "natural born citizen" based upon what is written in U.S. Code: Title 8, 1401, is that what you are saying? Dr Matt: Dear Gerald, you haven't yet answered my question to this comment by you: "Even though the "both parents" clause is not in the Constitution, it is the correct interpretation." I'll ask my question again: Is the correct interpretation of 'natural born citizen' based upon what is written in U.S. Code: Title 8, 1401, is that what you are saying?" The article entitled The Conclusive Definition of "Natural Born Citizen" cites only one reference to establish authority as being binding United States Law: U.S. Code Title 8, 1401 So exactly where in Title 8, 1401 do we find the "both parents" clause? What is the actual wording of the applicable Two Parent Law passed by Congress? In response to reading my personal message, Gerald deleted all his public facebook posts on this Natural Born Citizen issue. Based upon his avoidance behavior, Gerald must have known previously, or at least discovered for the first time, that there is absolutely NO MENTION of Natural Born Citizen or Two Parents Requirement or a Both Parents Clause in U.S. Code Title 8, 1401 — and this is why he deleted his facebook posts. Gerald tried to destroy the evidence that revealed he was either mistaken or intentionally telling lies. "Matt, you are a moron! Go crawl under a rock! Listen, the guy [Obama] is a fraud. Over 70 names and ss#'s, no one ever heard of him or even remembers him, he lied about his name, birthday and place of birth on all the documents we can find - no one else but Hitler just drops out of the sky unheard of to become "the man." Every thing he's done is damage to America." It's a common and curious human occurrence when people get so consumed with pushing a political agenda, that they are willing to intentionally lie. Compliments of the Liberal Left, we have Saul Alinsky's "Rules for Radicals" that encourage this rationalization: The Ends Justify the Means. Such dishonest rationalizing is employed by some on the Far Right through the Birther Issue. It is sad when certain right-wing propaganda pushers also profess to be "Christians." It is good to be honest and let the Facts go . . . where they will — regardless of whether the Facts fit a person's political preference.